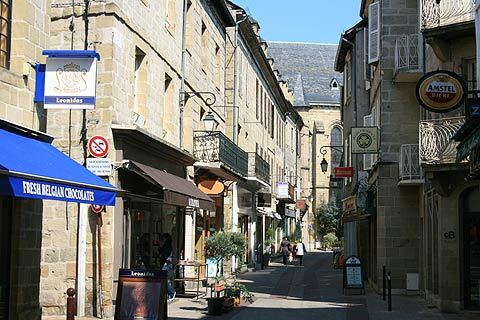 Brive-la-Gaillarde is a beautiful market town in the Correze department just over the border from the Dordogne department and well worth a visit if you are visiting the eastern side of the Dordogne. 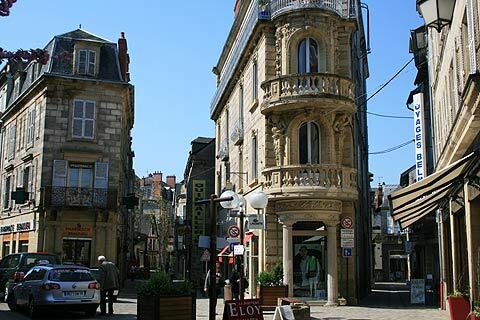 Brive has built up around an attractive medieval base and is now one of the more sizeable towns in the area making it a good base for exploring the upper reaches of the Dordogne or the department of Correze. 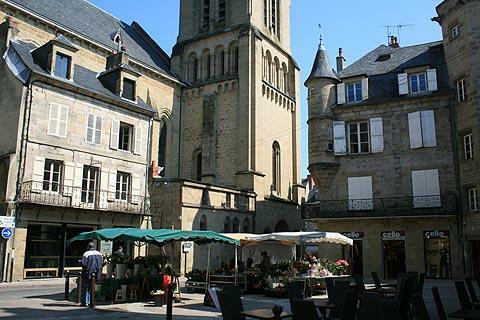 In the centre of town is the St Martin's church which was built in Romanesque style but has been heavily restored since. It has a 12th century crypt and some fine Romanesque capitals which are unusual for being in colour. 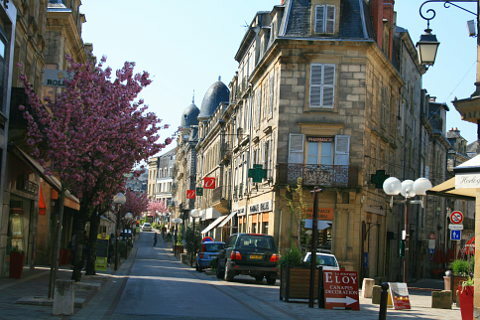 Radiating out from here are the main streets of Brive and walking through them are many delightful buildings to admire. Like Terrasson the buildings in Brive have slate rooves which gives the pale stone a slightly more austere but also more opulent air than the more earthy terracotta tones of most of the Dordogne area. Many of the buildings have striking features such as columns, turrets or balconies built of stone or wrought iron. There are a number of fine houses and mansions to discover, many of which date from the 15th and 16th centuries. The Maison Cavaignac has had a colourful history. It has been a convent, a ladies prison, a bourgeoise house and a museum over the years and is now home to the town archives. It has two main buildings linked by a round turret which houses the staircase. The ground floor of one side of the building has large arches which remain of the cloister of the convent. 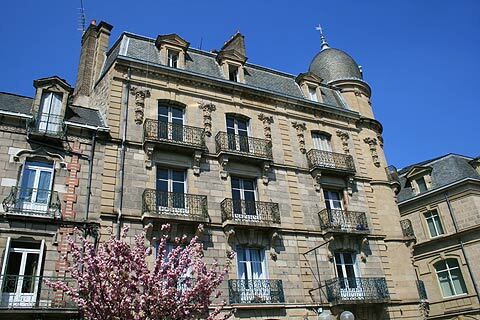 More buildings with fine features include la Maison Treilhard whch has a very unusual round turret with a second round turret built out from it and in one of the many narrow streets of Brive is the Tour des Echevins whose Renaissance facade is covered in fine sculptures. On the lovely Place Latreille is the Hôtel Quincart which has a large octagonal turret and a small round turret. 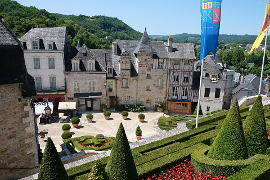 The 16th century Hôtel Noble de Labenche is another imposing building and is now home to a museum with a display of archeological finds from the area. Another treat is the indoor market in the Georges Brassens market hall. The weekly food markets are excellent and take place on Tuesday, Thursday and Saturday mornings. Also worth visiting are the goose and duck markets which take place 4 times a year and have many local foie gras suppliers. Brive is very pleasant to visit for an evening stroll as they have developed a "parcourse lumiere" (an illuminated path) with a number of the town's buildings and features lit up giving them an entirely different night-time atmosphere. 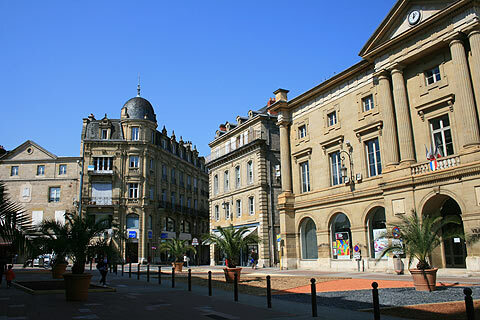 There are two museums in Brive. The Musee Labenche is a museum of Art and History in an attractive building. It includes a collection of 17th century Mortlake tapestries. There is also an interesting museum of Resistance and Deportation in the Musee Edmond-Michelet. It is in the home of a French resistance fighter who was deported to Dachau. Terrasson is an attractive town to the west of Brive-la-Gaillarde. 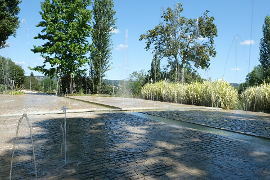 It is home to 'les Jardins de l'Imaginaire' - a very impressive modern garden. 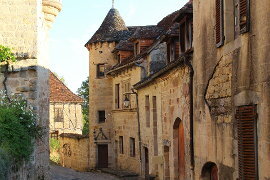 Also nearby is the Correze village of Curemonte which is one of the most beautiful villages of France.